In this special This Vertical Life feature, Assemble Papers editor Sara Savage meets some of the remaining residents at the Sirius public housing building in Sydney, who for the last three years has been fighting the NSW government’s decision to sell the building (as well as hundreds of other properties in the wider Millers Point area) to make way for luxury apartments. When the New South Wales Government first revealed in March 2014 its decision to sell off hundreds of Sydney’s public housing properties at Millers Point, Dawes Point and The Rocks – making way for the potential demolition of the historic Sirius building in favour of luxury apartments – the relocation process was slated to take two years. Thirty-two months later and nearly all of the 400 public housing tenants have been moved out of the area; but for a remaining few, the fight to save the historic Sirius building and its extended community is about to reach a critical juncture. 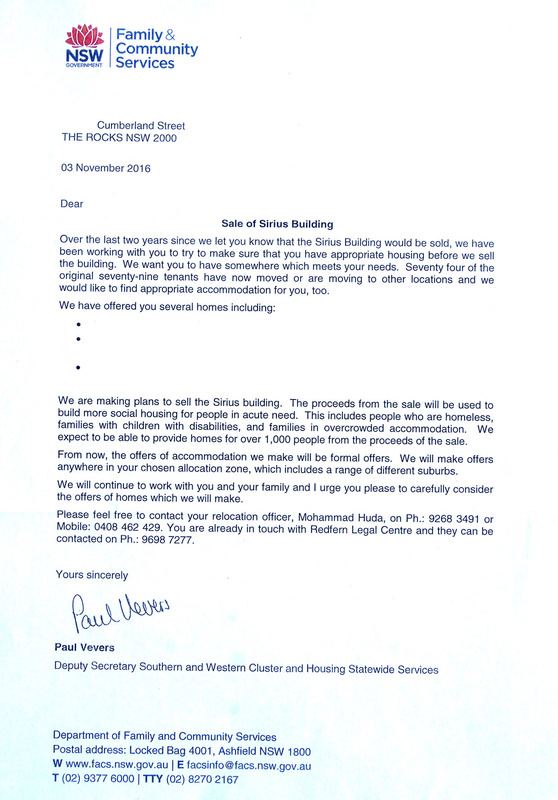 “We are making plans to sell the Sirius building,” reads a letter circulated earlier this month by the NSW Government’s Department of Family & Community Services to the five remaining residents of Sirius – an important public housing building, not to mention Brutalist landmark. The letter continues, telling the residents what they already know: “Seventy-four of the original seventy-nine tenants have now moved or are moving to other locations and we would like to find appropriate accommodation for you, too.” In this special This Vertical Life feature, Assemble Papers editor Sara Savage meets some of the remaining Sirius residents, as well as the activists behind the Save Our Sirius Foundation and Friends of Millers Point, to find out what the government’s latest efforts mean for them in the continuing battle to save this significant fragment of Sydney’s built and social heritage. Designed by architect Tao Gofers in 1978–79, the Sirius building was built with the intention of rehousing public tenants who lost their homes during the controversial redevelopment of the Rocks in the late 1960s and 1970s. Photo by Alisha Gore. Cherie Johnson, 61, is an original Sirius tenant, having moved in with her mother shortly after the project’s completion in 1980. “When I first moved into Sirius, I remember going around to Millers Point to buy the newspaper and people in the street would say ‘good morning’ to me – it was like a little country town, right in the city,” she says, smiling. It’s a different story now, with the majority of the area’s public housing tenants having been relocated by the NSW Government over the last two-and-a-half years. “It’s been a complete turnaround,” Cherie says of the rapidly transforming neighbourhood she’s called home for 36 years. Cherie Johnson, 61, is one of the original tenants of the Sirius building, having moved in with her mother in 1980. Photo by Alisha Gore. Immaculately kept and bursting with well-loved indoor plants, Cherie’s apartment is often referred to by her friends as a “doll’s house”. Photo by Alisha Gore. Sentimental trinkets line the walls of Cherie’s apartment in the Sirius building. Photo by Alisha Gore. Sirius was originally built with the purpose of rehousing public tenants who had lost their homes during the controversial redevelopment of the Rocks in the late 1960s and 1970s. When development was halted by union Green Bans in the mid-1970s, the sparkling-new Sirius became home to many who had lived on the nearby George, Playfair and Atherden Streets. (The irony of recent events in September 2016, in which the CFMEU construction union declared a Green Ban over the site, is not lost on many.) In particular, Sirius was designed to accommodate the elderly, as well as low-income families both big and small – a rare outcome for the NSW Housing Commission at the time, but one that’s ultimately responsible for the project’s success over the past four decades. Shaun Carter, president of the Australian Institute of Architects’ NSW Chapter and chair of the Save Our Sirius Foundation, has been a consistent and vocal supporter of Sirius and its greater community over the past few years. “Sirius got all the urban cues right from the get-go. They gave it a front door and put it on the street, and those simple yet fundamental things have meant that Sirius is a building that is and has always been of the community,” he says, adding that key worker accommodation and affordable housing are crucial to the functioning of any inner-city environment. View from the back of Sirius, looking over to the nearby Sydney Harbour Bridge and the popular Rocks district. Photo by Alisha Gore. The exterior of Sirius has hardly changed since it was first built in 1980 – a testament to the longevity and robustness of the design. Photo by Alisha Gore. Sirius’s architect, Tao Gofers (now 76 years old and very much involved in the Save Our Sirius campaign), was clearly inspired by Israeli-Canadian architect Moshe Safdie’s Montreal housing complex and fellow Brutalist icon Habitat 67 – easily one of the world’s most recognisable multi-residential projects. Though less than half its size, Sirius shares the modularity of Habitat 67, not to mention its inclusion of outdoor spaces like landscaped terraces and rooftop gardens, as well as communal space throughout the building. Both projects were designed with the wellbeing of future tenants in mind – something often overlooked in the present-day realm of affordable housing, and rarer still in any densely populated inner-city scenario. The common room on the ground floor of Sirius’s tower building used to be used for weddings and other family functions. These days it’s eerie, quiet and closed off to the remaining residents. Photo by Alisha Gore. Kelly Moss stands outside her mother’s Sirius apartment. Both Kelly and her mother were among the original tenants of the building. Photo by Alisha Gore. Myra Demetriou, who turns 90 next week, has been a ‘tough-as-nails’ figurehead for the Save Our Sirius campaign, and is known for the recognisable ‘SOS’ lights in her window. Photo by Alisha Gore. Myra’s and Cherie’s apartments sit directly on top of one another, and the two women became close after Cherie’s mother Betty died a few years ago. Speaking to them both in Myra’s unit (known to many as the apartment with the ‘SOS’ lights in the window), they agree their ideal outcome would be to stay – if not in Sirius then in the Millers Point area. Thanks to the mammoth efforts of the Save Our Sirius Foundation, the Friends of Millers Point group and the Millers Point, Dawes Point and The Rocks Resident Action Group (the latter led by lifelong Millers Point resident Barney Gardner – another of the final few remaining), in September 2016 more than $50,000 was raised through a public crowdfunding campaign to challenge Minister Speakman’s rejection of the Heritage Council’s recommendation to heritage-list the Sirius building. On Thursday 3 November, the Environmental Defenders Office on behalf of the Millers Point Community Association officially challenged the decision in the hopes of reversing it – a court date is set to be announced on Friday 25 November. Meanwhile, the NSW Government’s Family & Community Services department continues to make aggressive attempts at relocating the remaining residents without further delay. The modularity of the Sirius exterior shares similarities with that of Moshe Safdie’s Habitat 67 in Montreal. Photo by Alisha Gore. Still intact to this day, the original carpet in the common areas of Sirius mimics the exterior pattern of the building. Photo by Alisha Gore. On the day we visited Sirius, local resident and tireless Sirius Foundation member John Dunn was kind enough to show us around. John stresses the importance of holding on to residents like Myra, Cherie and Kelly, but adds that many community members do understand the government’s need to sell some of the property. “For years the community has been calling on the government to do this, but differently. Many historic houses owned by the government were left vacant for years and were becoming derelict, with the government unable to look after this heritage. Now the government is unable to look after Sirius,” he says, noting that to retain Sirius as social housing would be ideal, but that the Foundation would be open to a number of middle-ground solutions. Amazingly, Sirius’s exterior remains extremely well kept despite the mass exodus of residents over the past three years – this gate is an exception. Photo by Alisha Gore. It’s hard to know which fate lies ahead for Sirius, for the handful of remaining residents in the building, and for the broader Millers Point community. One thing, however, is certain – there’s no shortage of people to help fight the cause. Shaun Carter thinks the media attention and overwhelming public and political support Sirius has received taps into a broader consciousness about the future of our cities and the way they should be managed. He hopes the Sirius building will go on to be a positive, landmark case for the preservation of architecturally and socially significant buildings in Sydney and beyond. Our deepest respect and gratitude to Cherie and Myra for welcoming us into their Sirius homes, and to Kelly for sharing her story. Thanks also to Shaun Carter and John Dunn for their assistance and insight in putting this story together. Lastly, the beautiful photographs in this article were taken by the talented Alisha Gore – see more of her work here: alishagore.com. Assemble Papers supports the Sirius Foundation in challenging the NSW Government’s decision not to heritage-list the Sirius Building and wishes the residents and community members all the best in their quest for the fairest outcome possible. For regular updates on Save Our Sirius, you can join their mailing list here. (L–R): Kelly Moss, Myra Demetriou and Cherie Johnson are among the five remaining residents in the Sirius building at the Rocks, Sydney. Photo by Alisha Gore. The building is bordered by a spacious walkway and luscious trees. Photo by Alisha Gore. Myra Demetriou, 89, has lived in Sirius since 2008 and in the Millers Point area for 60 years. Photo by Alisha Gore. An old distress alarm lies dormant in the foyer of the Sirius tower building. Photo by Alisha Gore. An exterior view of the Sirius building. Photo by Alisha Gore. If you're a 'meat in moderation' kind of person – as with any food – home made trumps processed stuff any day. Here, Pino shares a family fave, the People's Pancetta. For this, all you need is time, simple, good quality ingredients and a cool nook in a laundry or pantry. Avert your eyes if you are vegetarian – in coming weeks we promise more herbivore recipes to cater to every stomach.